Fugitive History: The Art of Julie Gough, book cover. 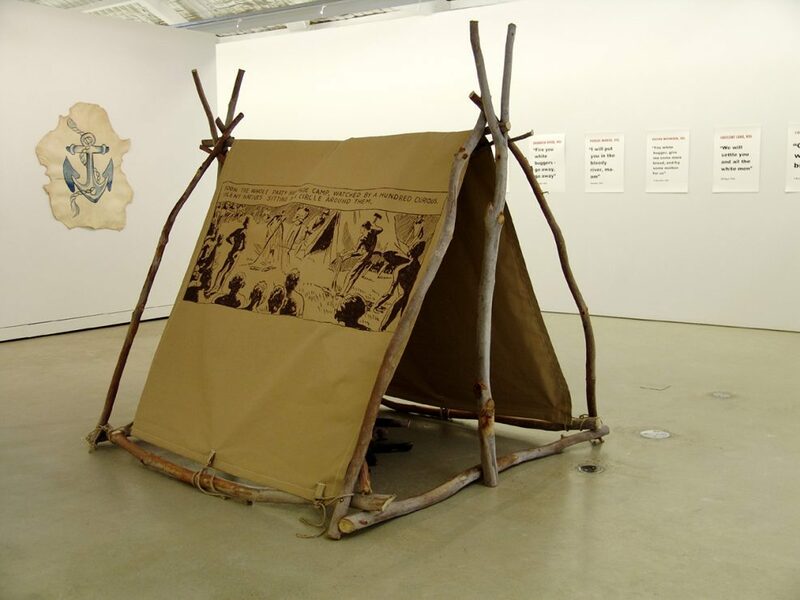 Julie Gough, Uninvited interventions, 2007, wood, canvas, acrylic paint, 198 x 190 x 200 cm. Julie Gough, Some words for change, 2008, tea-tree, book pages from Clive Turnbull’s book ‘Black War’ dipped in wax. Photograph by Simon Cuthbert. 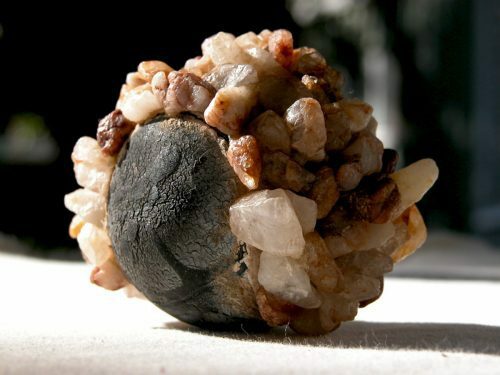 Exhibited at Ephemeral Art, Friendly Beaches, Tasmania. 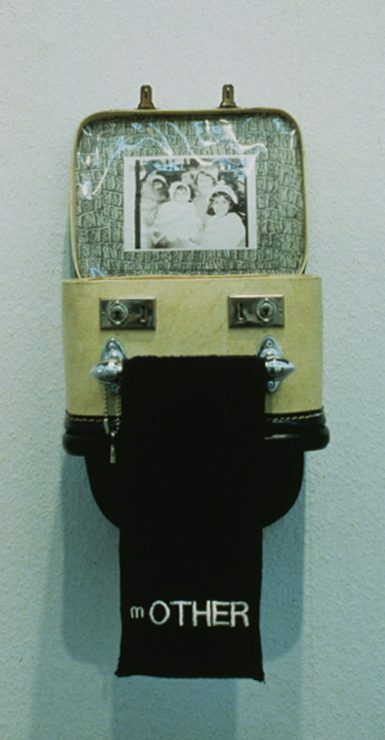 Julie Gough, mOTHER, 1995, mixed media, variable dimensions. Collection of the artist. Inheritance is something we all have in common. We inherit things. I grew up knowing hardly anything about my family; I was even confused about who I was named after. Until my early thirties I thought my namesake was Julie Andrews, star of the movie The Sound of Music, released in the year of my birth. I even made an artwork about Andrews in a series about seminal childhood influences: Psycho,Julie, Luna (1994). Shortly afterwards my mother told me I wasn’t named after Julie Andrews, that she had always liked Julie Anthony more. Again and again I find myself questioning what we are given, or imagine, as our histories. Identity, a common denominator for all people, is the principal structure by which we socialise, make sense of the world and direct our behaviour. I was born in St Kilda, Melbourne, in 1965, the eldest child of a Scottish-born father and a rural Victorian-born mother. Both sides of my family beyond immediate aunts, cousins and grandparents were absent and distant. Scotland and Tasmania were the places I grew up hearing about but not visiting. I felt we were exiled in Melbourne, in part by war. Post World War II my grandfather relocated his family from Glasgow to Melbourne; six years in the heat of India and Burma had made his Scottish homeland too cold to bear. In another way war had also resulted, eventually, in the movement of my mother’s mother from her Tasmanian homeland to Victoria. Julie Gough, Traveller (video still), 2013, HDMI video projection, 16:9, colour, sound, 8 min 43 sec, edited by Jemma Rea. The Van Diemen’s Land “Black War” of the 1820s forcibly removed most Tasmanian Aboriginal people from their country into exile by the 1830s, on Bass Strait Islands or isolated across Tasmania as servants for the newcomer British – these were the experiences of my maternal Aboriginal family. The desire to understand the lives of my ancestors, all of them, is what brought me to art. Art is not only a visual outcome; making each artwork is my way of proceeding through the quagmire of the past. Each piece is the result of thinking, collecting, travelling, rebuilding stories from the fragmented history I have inherited. 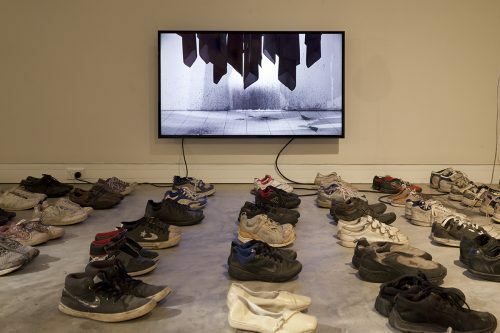 Together the works accumulate and reveal the fraught path of encounter and response with events and people. My art is a chronology of my own life and a parallel charting of the times before me. 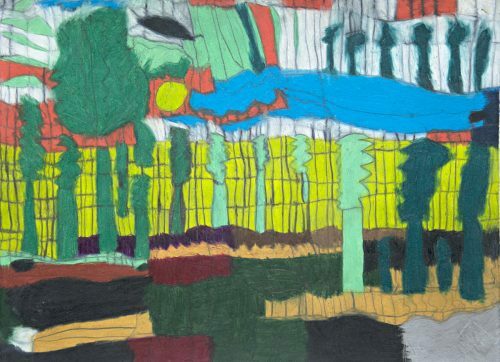 When I formally started making art in the early 1990s the subject was my own childhood and simultaneously the period of colonial frontier violence. Twenty years later my work is still enmeshed in, and moves between, these very same things. In 1989 I returned to Australia after two years in Europe, where I had worked in a poultry factory and a music shop in Hereford, a sandwich shop in Sheffield, a games shop in London and as a nanny in Brescia, Italy. Although I had previously completed a BA degree in 1986 in Prehistory at the University of Western Australia, I didn’t feel comfortable interpreting or digging up other people’s Country in Western Australia, so the degree was shelved and I found work in an Army Surplus shop in Perth. 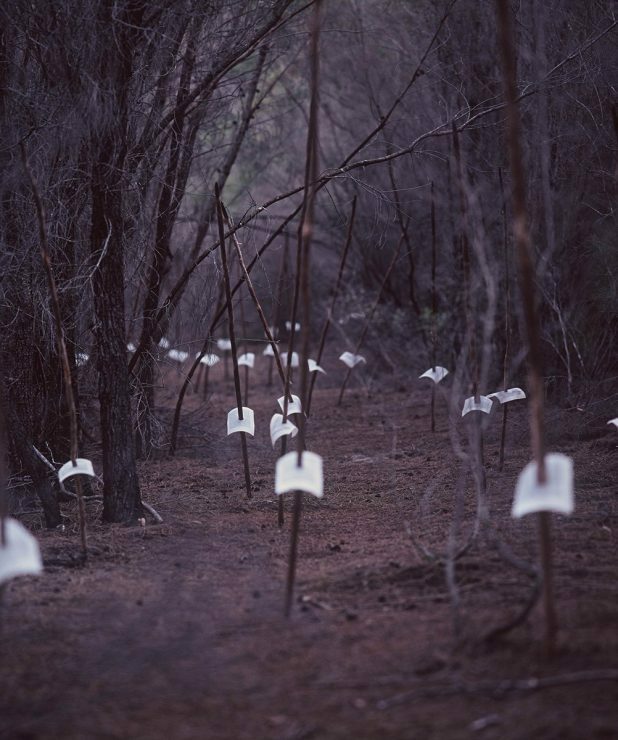 Julie Gough, Manifestation (Bruny Island), 2010. Photograph by Julie Gough. Most of my life I have felt unsettled, mobile and open to follow unexpected routes. I hadn’t studied art at high school. My main memory of attending four primary schools was playing alone, making cubbies inside large bushes or on the grassy bank of the defunct St Kilda rail line. I thought I would perhaps become an archaeologist or librarian. All I was certain about was that I was a collector and I knew it from a young age. I enjoyed working in the surplus store; perhaps I would still be there but for a critical collision in 1990 in the far north-west of the state. Riding pillion on the back of a motorcycle, I was leaning out to look on a large eagle at a carcass on the side of the road when it flew directly into my face. Both the bird and I were shocked, neither critically. We left him stunned and blinking, but otherwise sound, under a small tree and continued the journey. When I returned from the long weekend away, things were different; I too had woken up, blinking. What was I doing? Why was I in Western Australia? I enrolled in TAFE to study drawing and worked part time in the surplus shop. Unplanned but on the advice of the drawing lecturer, I attended an interview session at Curtin University with the folio of my year’s work. In 1991 I began my second BA degree, this time in visual arts. Increasingly my art focused on Tasmania and my family history, with forays into pieces about television shows that inspired me, such as David Carradine’s Kung Fu, or my rabbit, who continually excavated fascinating things from the garden. By the end of 1993 and the BA degree, I was ready to return to Tasmania, the home where I had never lived. At that point I began the long process of trying to understand what had happened that we had almost forgotten ourselves. I relocated to Hobart for my Honours year in 1994. This set me on the path of learning more about how my family had become such fair-skinned Aboriginal people. During the mid to late 1990s my art and research reflected very broadly on national policies on race and the effects on and representation of Aboriginal people, particularly in the 1950s and 1960s. I found much material visible in attitudes and products of those times, including songs, ornaments and souvenirs created by mainstream popular culture. 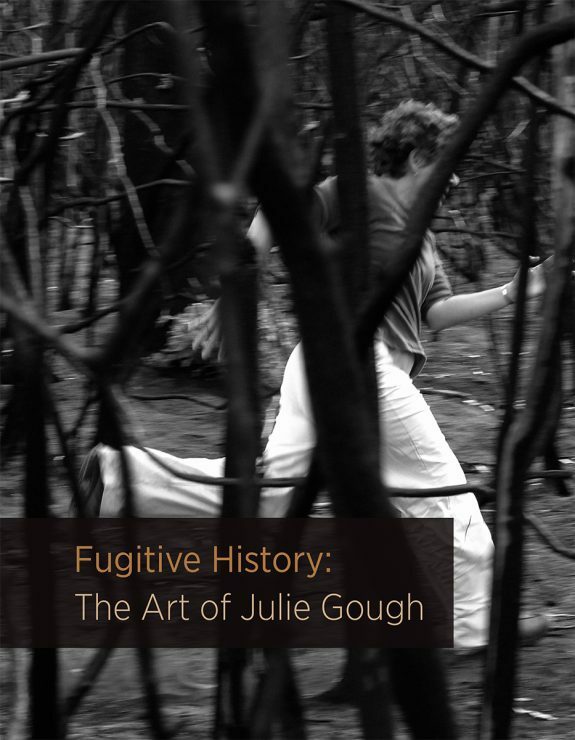 Fugitive History: The Art of Julie Gough is available from UWA Publishing and all good bookstores. In After Voices, Kuswidananto used animatronics, sound, video and sculpture to create a ghostly protest procession that had a distinctly theatrical edge.